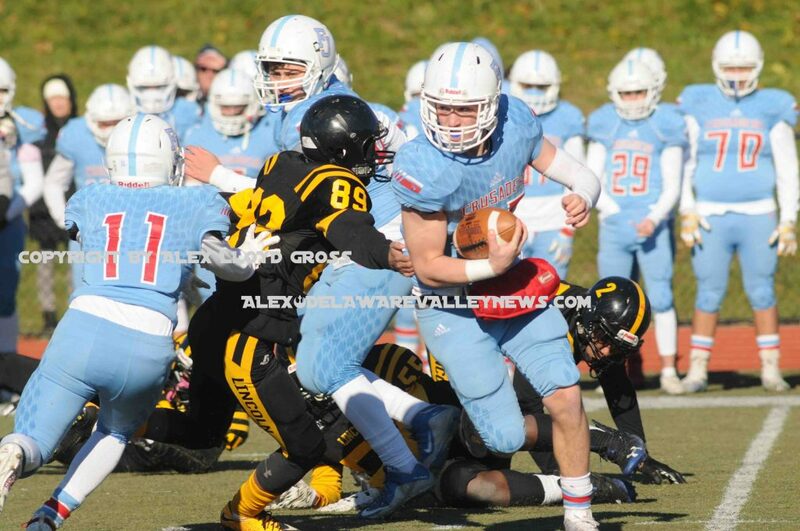 Alex Lloyd Gross- Photo- Delaware Valley News.com Father Judge easily cruised the ball past the Lincoln defense. 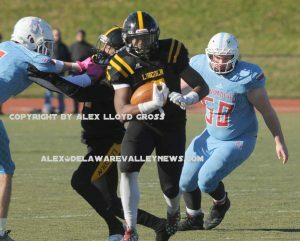 Alex Lloyd Gross- Photo- Delaware Valley News.com In the first quarter, Lincoln scored a touchdown. The defense for Judge was all over Lincoln for the rest of the game. Thanksgiving Day means football for a lot of people. Sure, at times, professional games are played that generate interest and college sames as well. In the morning, there are high school games to be played. One of the longest rivalry games ever is Lincoln V Judge. For a long time, Judge has been beating Lincoln and badly. As the game started, it looked like Judge was going to run away with the game, scoring a touch down in the first six seconds of the play. Lincoln came back and put six points on the board during their next possession. It looked like it might be a close contest. An actual football game, not a blow out. The six points Lincoln scored, were the only points they would put on the board during the entire game. Judge, who had a horrible record this year was actually expected to lose to Lincoln, going in to the game. The game was played at Lincoln. The final score was 40- 6. It was the best Father Judge played all season.